I seem to give myself odd assignments. 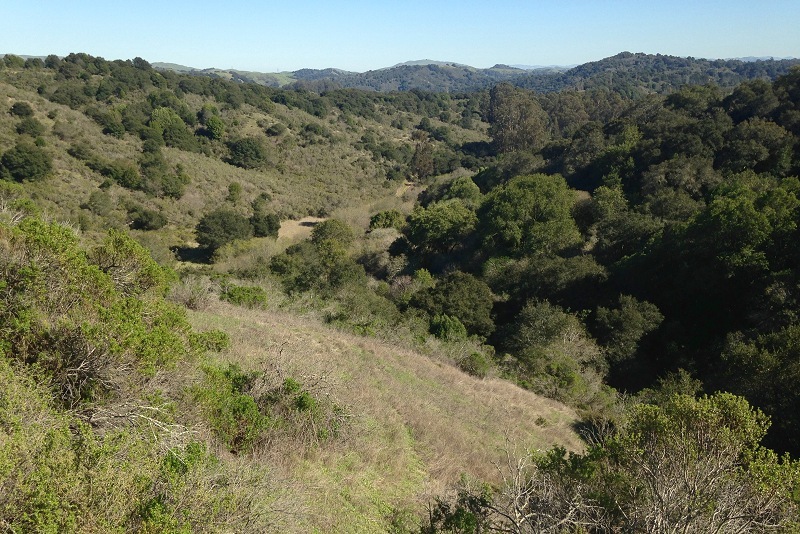 The latest one was to take a hike around the crest of Shephard Creek’s watershed, better known as Shepherd Canyon. 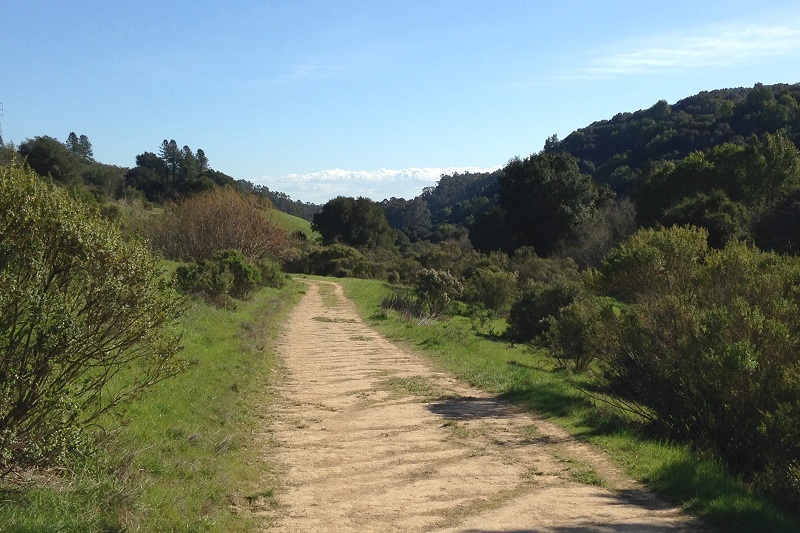 Only during the final mile of that 6-mile walk did I realize what it meant: an outing exclusively on ridge roads. 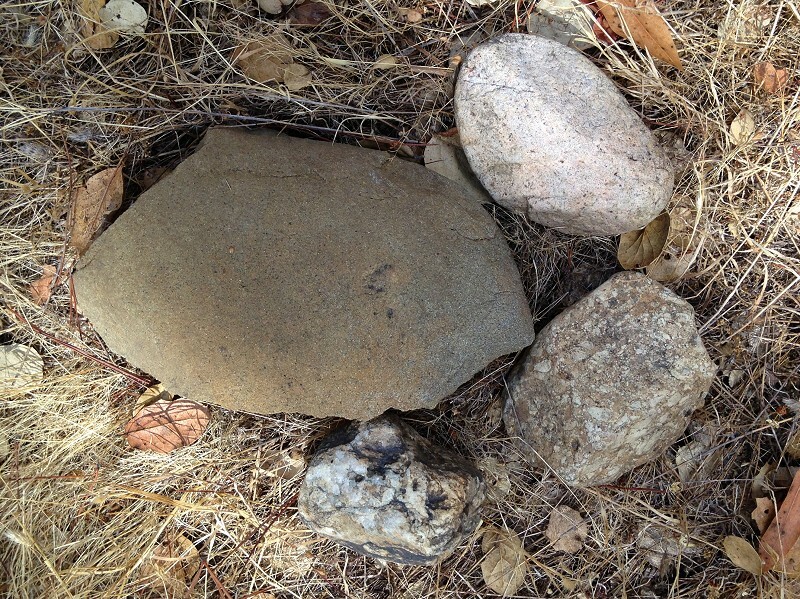 I got the idea from my circumambulation of Claremont Canyon three years ago. 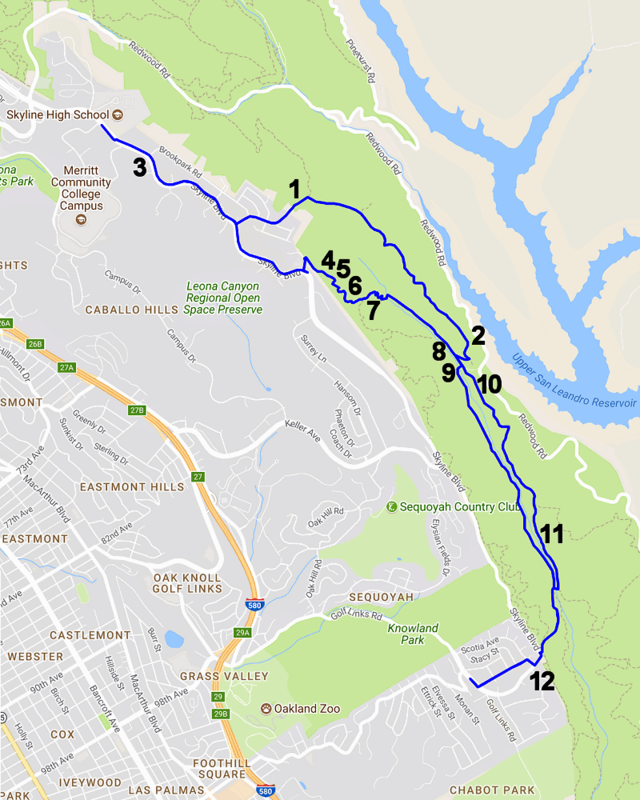 That walk features a variety of rock types and a good set of views into Oakland’s best wineglass canyon — a stream valley with a wide upper watershed and a narrow outlet where it crosses an active fault. 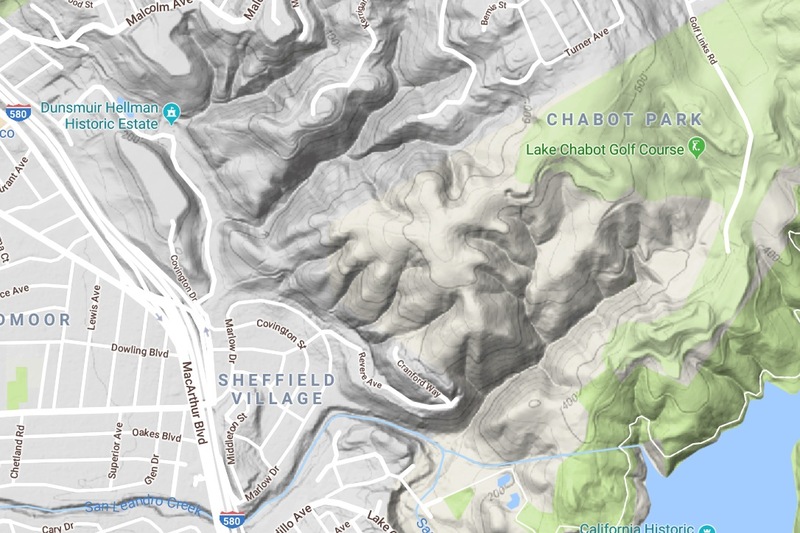 Most of Oakland’s major streams that cross the Hayward fault have wineglass valleys that are more or less well-formed (and faceted spurs between them), but you may have to scrutinize them pretty hard to see them, let alone walk their rims. 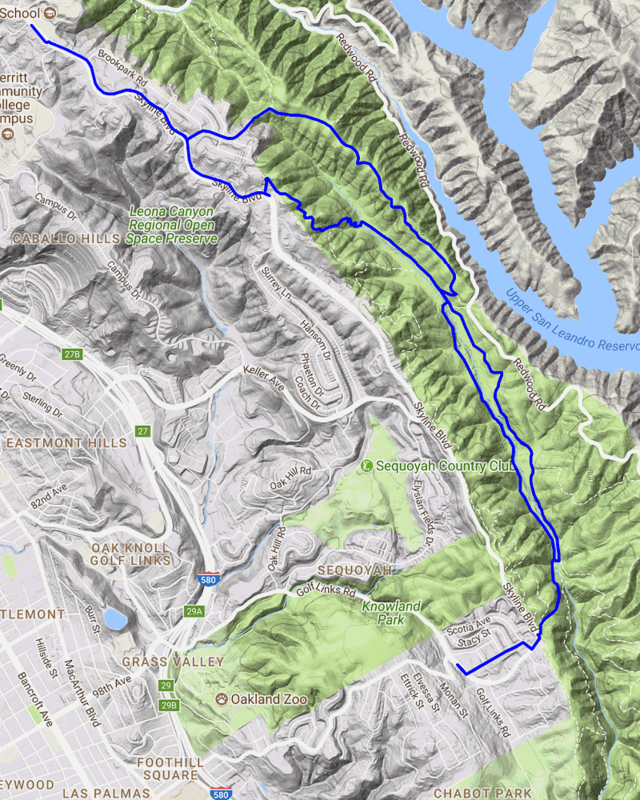 Shepherd Canyon is another of our wineglass canyons where the roads make this exercise feasible — and an exercise it is, with a thousand-foot elevation gain. The trouble is, you don’t get clear views into the canyon itself. 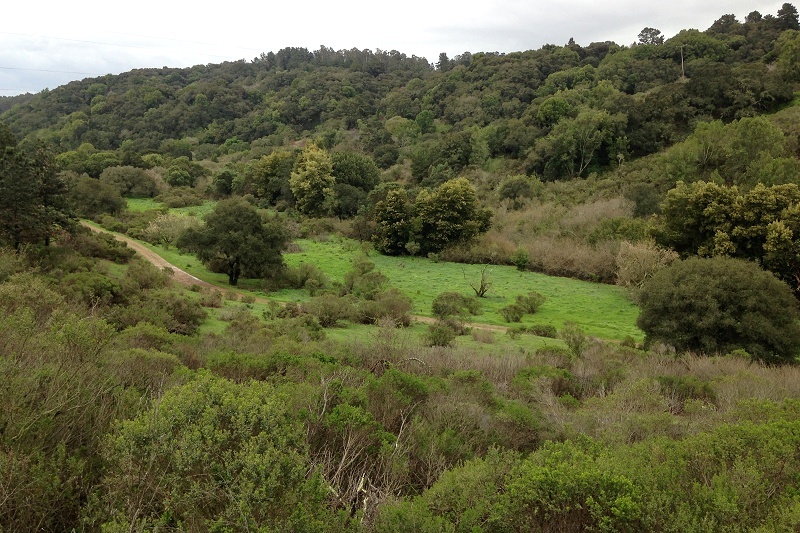 Whereas Claremont Canyon is a viewshed as well as a watershed, Shepherd Canyon’s watershed has an inside-out viewshed. Thanks to our high parklands, this ridgetop walk affords good views around the canyon’s outer side. Enough preamble — let’s amble. The route starts and ends in Montclair on the geologically friendly 33 bus line. Here’s the layout. Those little red blips are mile markers. I took this counterclockwise because I prefer steep uphills to steep downhills, and the south end is steep. 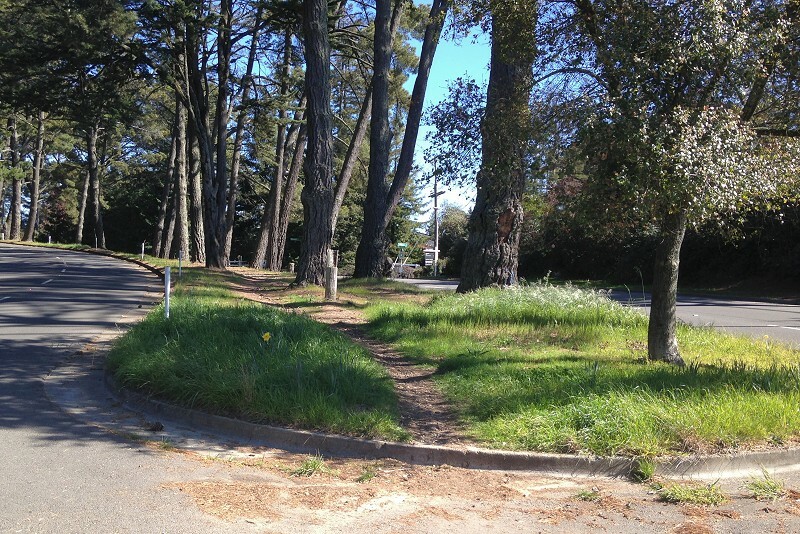 A bicyclist might prefer the other way, but parts of this route are footpaths. You could start and end this walk at the end of the 33 line in front of the Safeway, but I started from the Snake Road stop and finished at the LaSalle Avenue stop. Most of the first mile is a bit of a chore along busy Mountain Boulevard, but these days the rain has made the creek noisy, and you’ll hear it down in the woods as you cross the lowest point near the Park Avenue junction. Be sure and get off the road on this nice path. 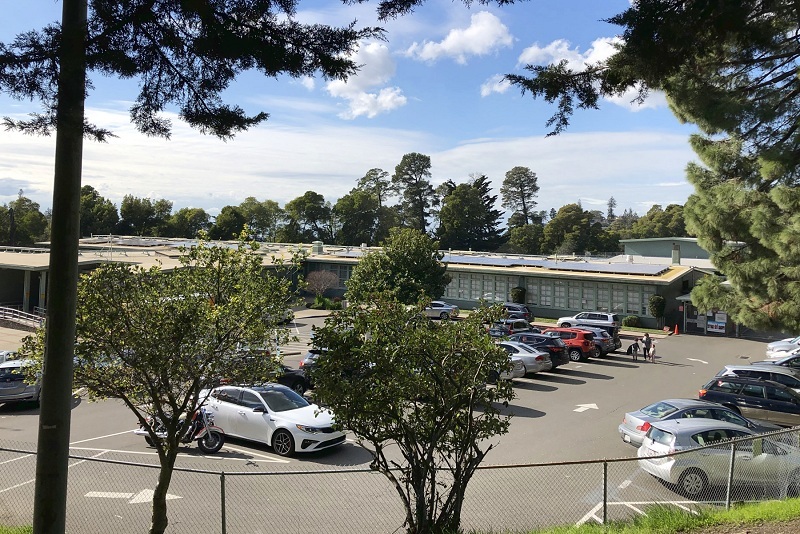 It goes around the flattened hilltop housing the Joaquin Miller Elementary School and Montera Middle School. There once was a rocky hill here, occupied by a Scout camp (which is how Scout Road got its name), but it was vacated and leveled as a handy source of stone and used (I believe) as fill for the Warren Freeway nearby. 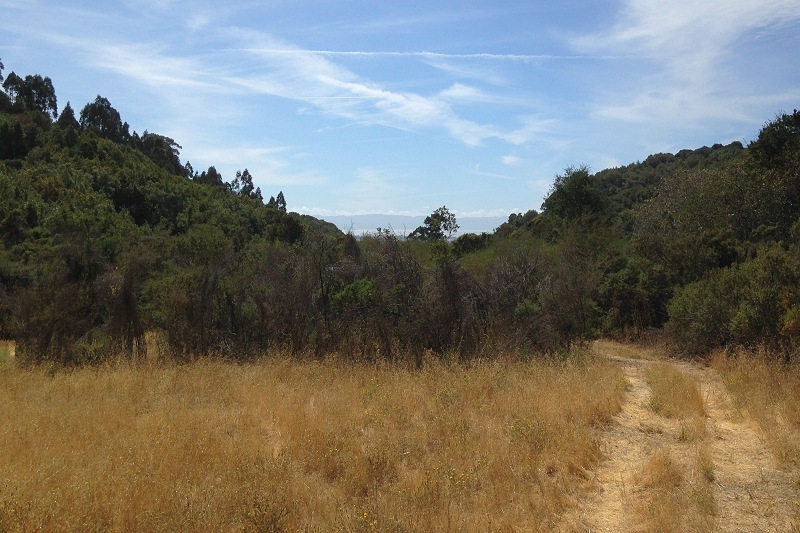 In any case, the path takes you to the foot of Shepherd Canyon’s perimeter ridge, where you’ll turn right up Mountaingate Way. This view past the foot of Mountaingate looks into the valley of Cobbledick Creek, a tributary of Shephard Creek that runs down along Scout Road. In the next mile you’ll climb 800 feet, pretty steadily. Soon enough you join Castle Drive and start seeing rocks. Now it’s time for the bedrock map. 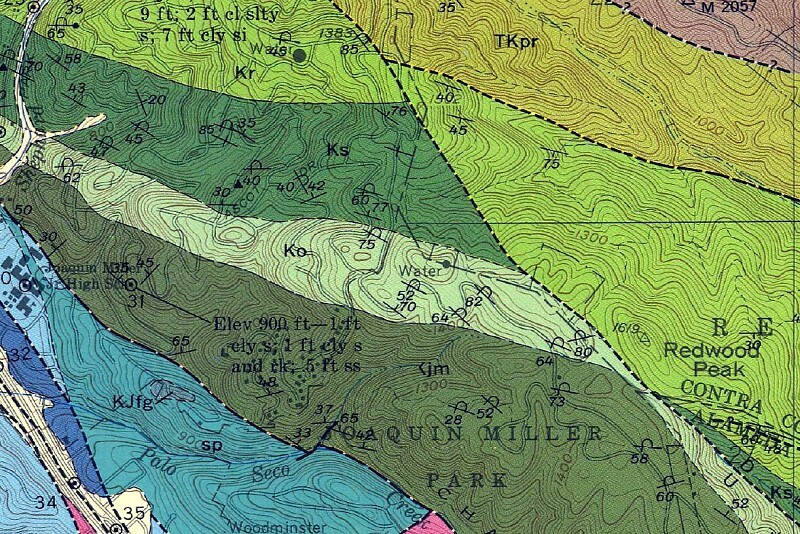 The ridge is made up of serpentine rock (sp on the map) plus its typical blocks of blueschist. 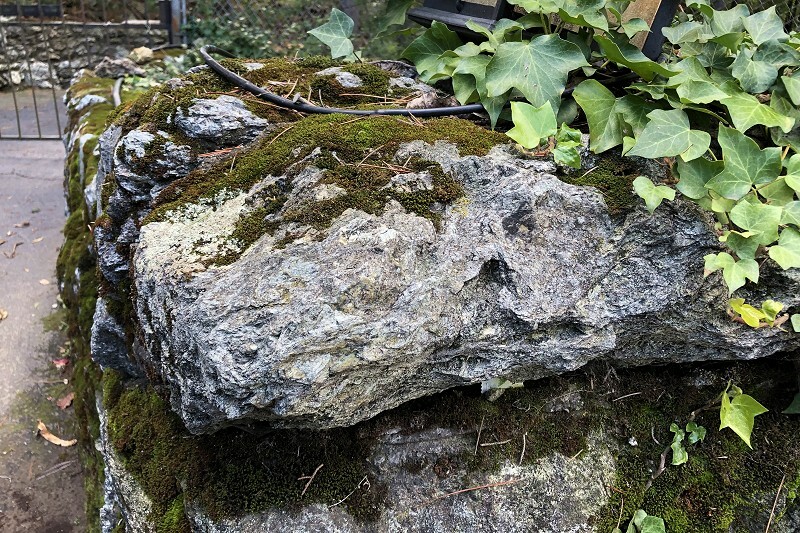 One of the city’s best blueschist boulders sits where Castle Drive starts, and some of the homes along Castle use the blueschist in their landscaping. 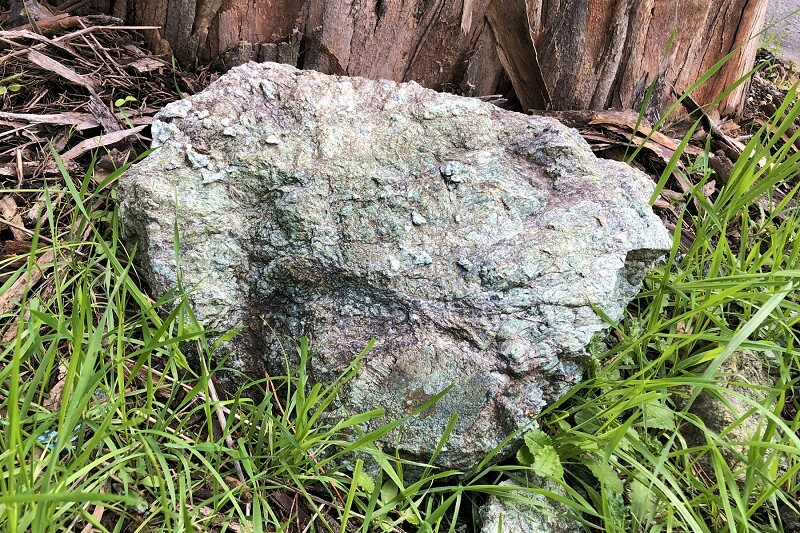 The serpentinite is a sloppier, greener stone that you’ll see along the roadside. Let me warn you that hiking on Castle is a challenge — the road is narrow, there’s no sidewalk, and nobody expects pedestrians. Keep your ears open and step off the road as cars approach. Where Castle starts to turn north, veer off the road and take the little-traveled West Trail, part of Joaquin Miller Park. You’ll thank me, as I said when I took you down it a few months ago. It’s here that your first views open up. And the rocks change as you start on the trail. From here on out you’ll be mostly on sandstone. Just for the record, you’ll pass through the Joaquin Miller Formation (Kjm), Oakland Conglomerate (not labeled), Shephard Creek Formation (Ksc), Redwood Canyon Formation (Kr), unnamed Eocene mudstone (Tes), Sobrante Formation mudstone (Tsm) and just into the edge of the Claremont Shale before descending through the same units on the way down. 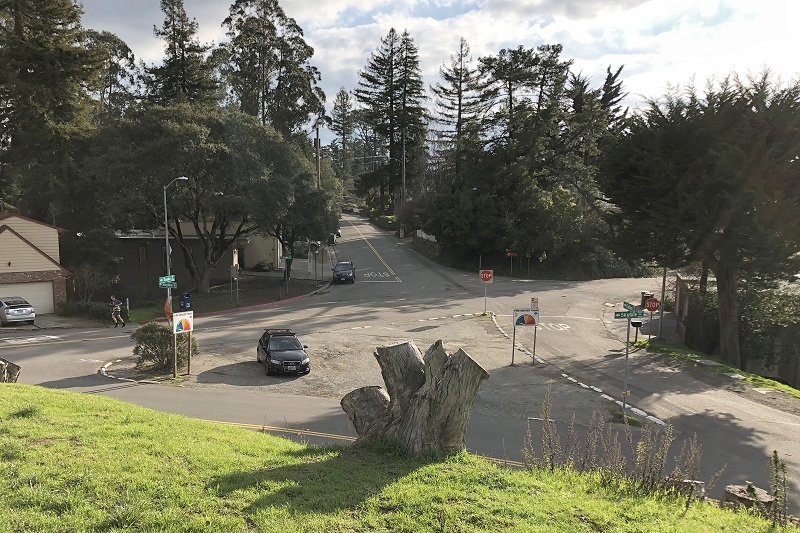 Castle Road ends at Skyline Boulevard. 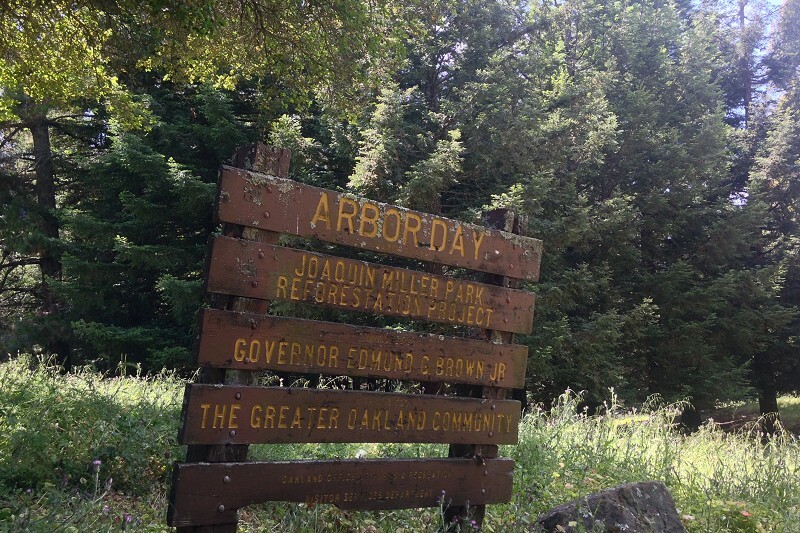 After a few steps on Skyline, duck into the woods and take the Scout Trail parallel to Skyline, where you’ll meet these guys at the top of the ridge — Oakland Conglomerate. Where the trail ends at Moon Gate, take Skyline for a few hundred yards, passing the Waterloo Staging Area (unless you’re up for a stroll on the West Ridge Trail, which rejoins this route at Skyline Gate), and take Wilton Drive up onto the ridgetop. 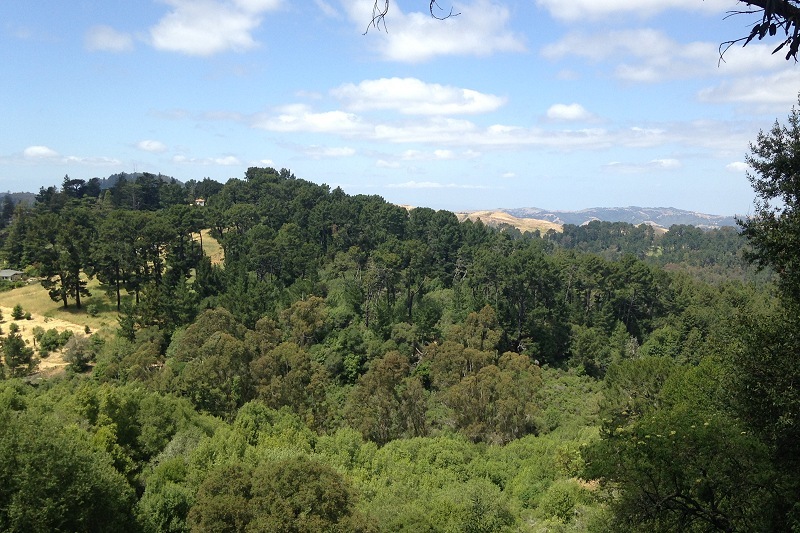 It skirts the edge of Redwood Regional Park and has one of Oakland’s best views. Move on and take Burton Drive, then Shirley Drive. 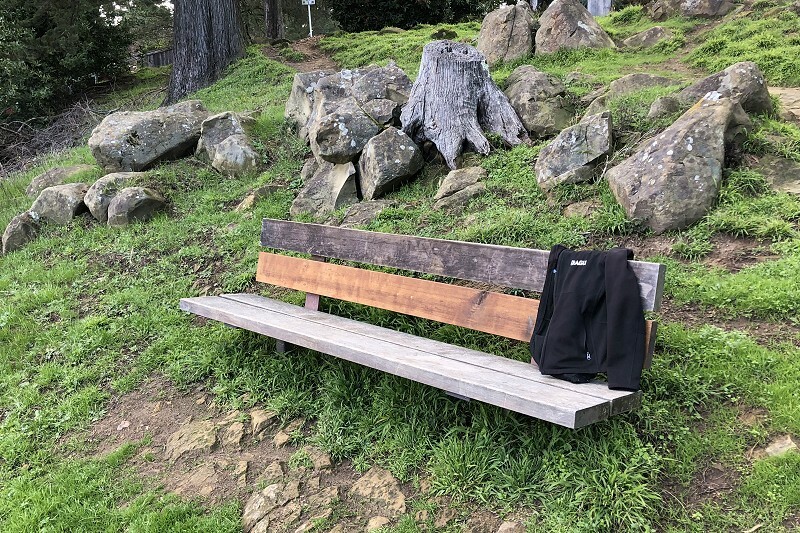 At the end of Shirley is an unmapped trail through Redwood Park that starts with this bench, nestled among boulders of Redwood Canyon Formation sandstone. Not quite the halfway mark, but just the place to take a rest and a good look around. The trail descends to the Skyline Gate Staging Area. From there, take Skyline to its confusing junction with Shepherd Canyon/Pinehurst Roads. 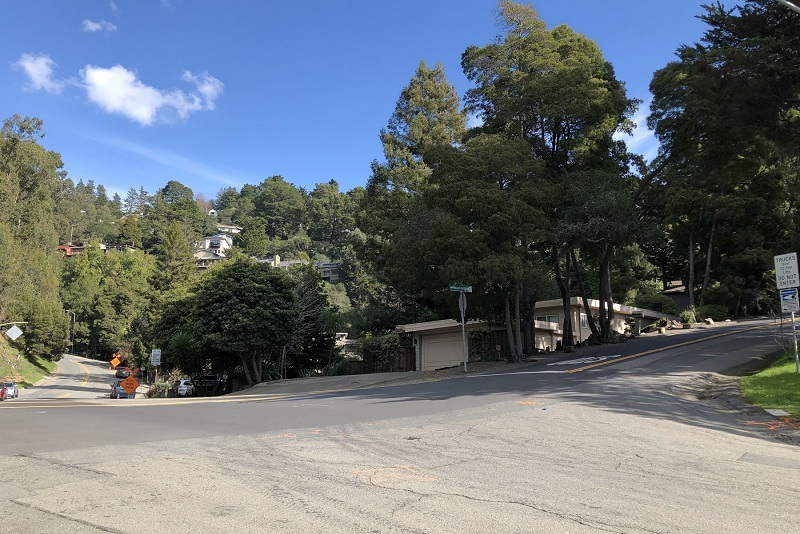 Don’t take any of those roads — go up Manzanita Drive instead, along the ridgetop. 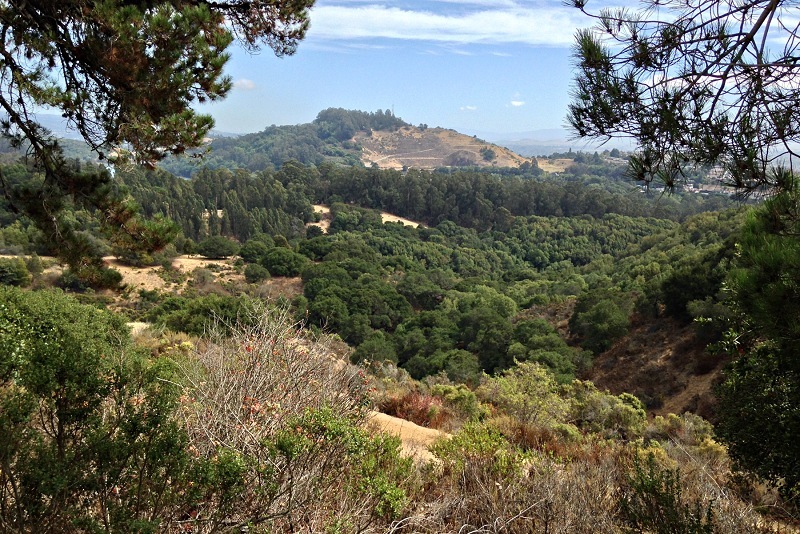 Where the power line crosses the ridge is a fine exposure of the Sobrante Formation’s shale. 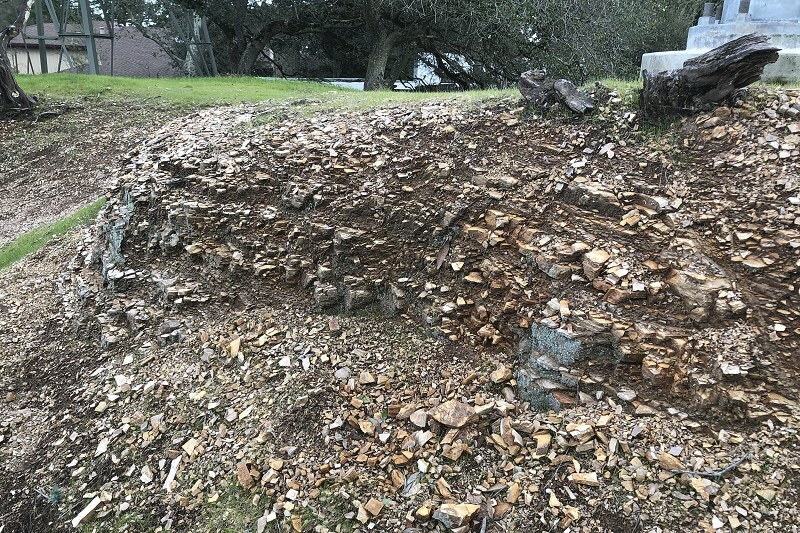 This is an unusually good exposure of the Sobrante, which is very sloppy stuff along Skyline, because up here it’s grading into the harder chert of the Claremont Shale. The two units are stratigraphically continuous, with an arbitrary boundary between them. 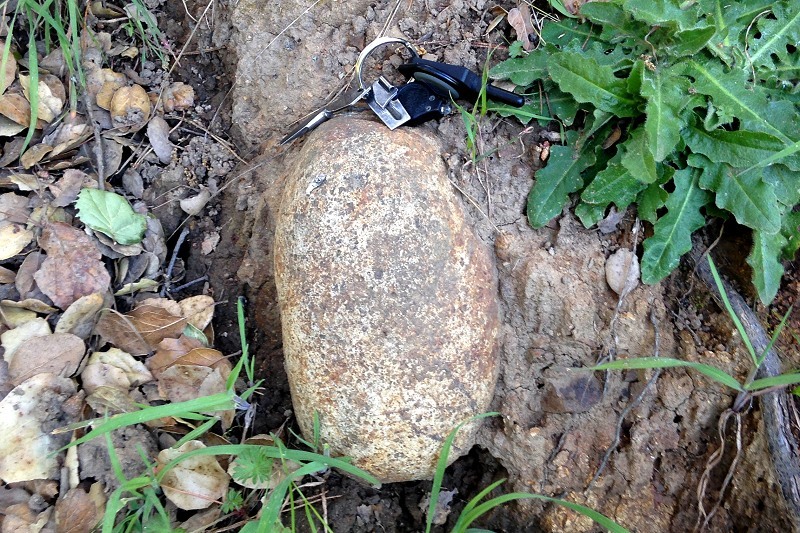 You’ll see a lot of this rock along the road as you make your way north, then down to the junction of Skyline and Snake Road. At this spot you overlook Shepherd Canyon on the left, Thornhill Canyon on the right, and the mighty Bay in front as you start down. Do stop at the fire station here and top up your water supply. 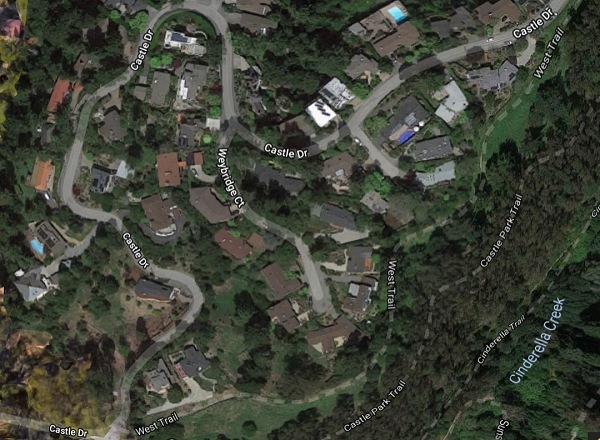 The descent along the lip of Shepherd Canyon is straightforward: Take Colton Boulevard to Asilomar Drive to Drake Drive. Again, pedestrians are not expected, but the roads are generally wide enough to accommodate everyone without jostling or stir. Here and there you can see into the canyon. Watch its walls grow close as you come near the narrow part of the wineglass. When Drake meets Magellan (I know, those two explorers never actually met), the ridge road is finished. It only remains to take the unobtrusive path leading through the trees from 2133 Magellan down to the Railroad Trail — when else will you ever have the chance? — and on into Montclair to catch the bus. The nice thing about this time of year is that many of the trees are leafless, so you can see more of the surroundings. That and the weather is cool. I always seem to assign myself weird walks in the high hills during summer, which can be brutal. Better to get out there now. 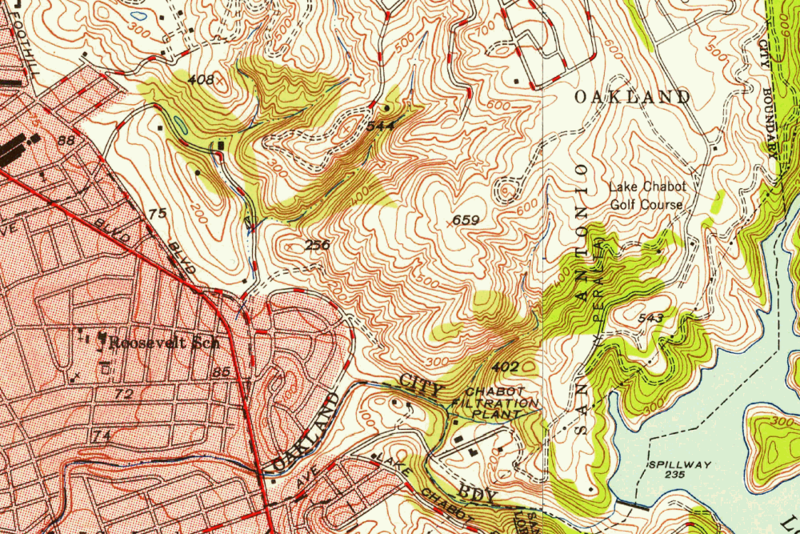 In 1914, UC Berkeley professor Andrew Lawson published the first decent geologic map of our area, the San Francisco Folio of the Geologic Atlas of the United States. That’s where the Oakland Conglomerate got its name. But while that fine rock unit lives on in name, the concept it represents has changed. 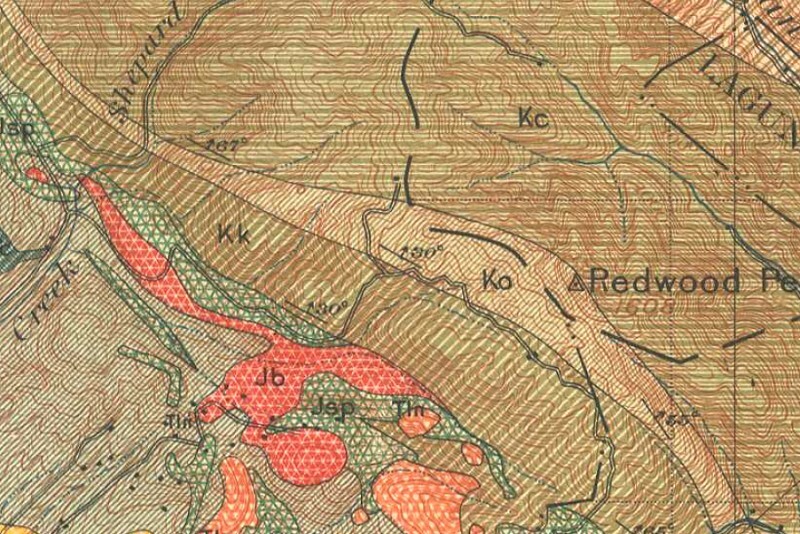 Let’s look at a hundred years of progress in geologic mapping the area just west of Redwood Peak, the heart of the Oakland Conglomerate. Here’s Lawson’s map from 1914. Orient yourself by finding Redwood Peak. 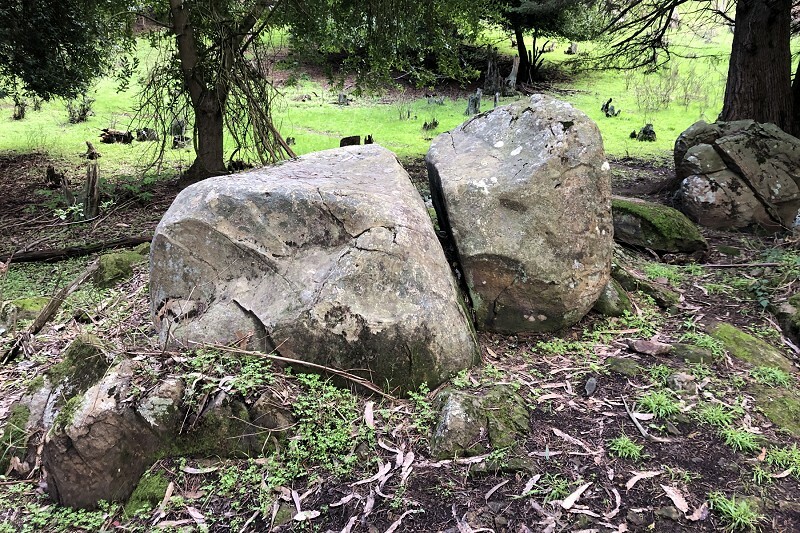 The belt of rocks labeled “Ko” is the Oakland Conglomerate, the road winding along it is called Skyline Boulevard today, and the road heading leftward from it is today’s Castle Drive. 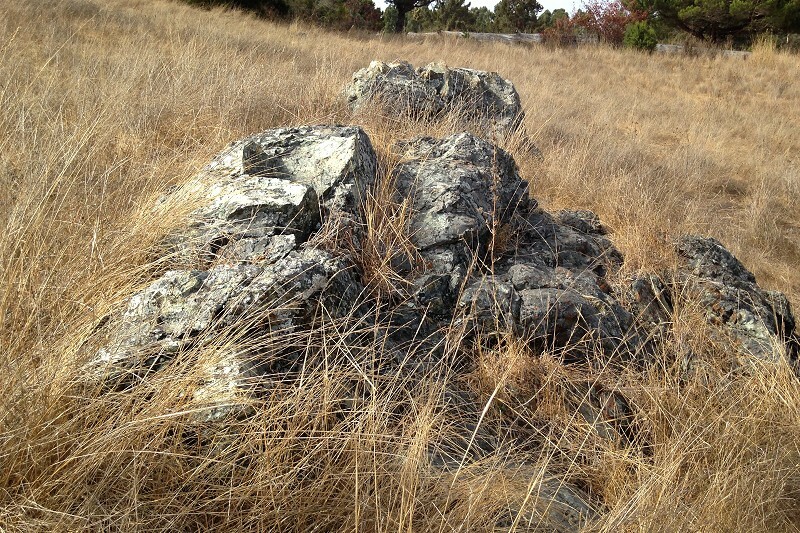 Lawson called Ko the “Oakland conglomerate member of the Chico formation,” a name and classification by which he meant that these rocks were notable but not important enough in the big scheme of things to single out. To be fair, he was dealing with a very large, detailed and cryptic field area at the time. Case’s thesis was approved in 1963. His map, published a few years later in USGS Bulletin 1251-J, is so badly reproduced it’s embarrassing. Instead I’ll show Dorothy Radbruch-Hall’s elegant map of 1969, which incorporated Case’s work. And for completeness’ sake here’s the current standard map, by Russ Graymer from 2000. It’s a cool area. 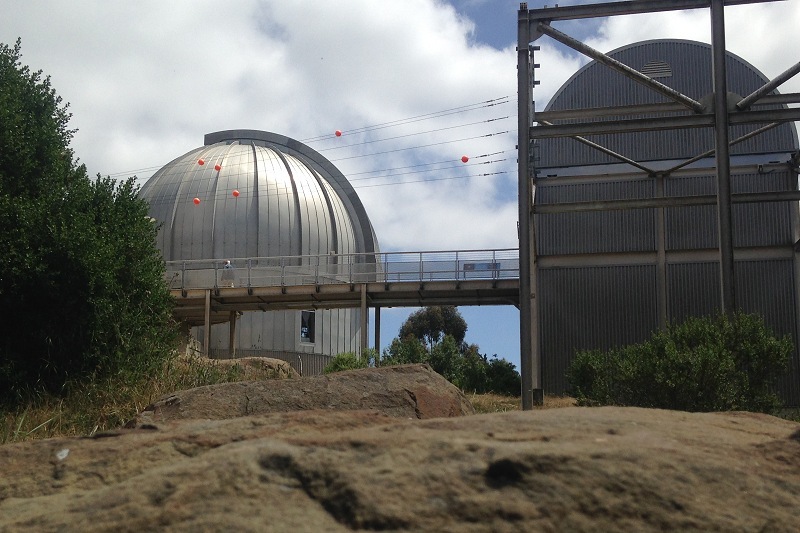 I recommend visiting it the way I did: take the 339 bus up to Chabot Observatory and hike down to Montclair or the Leimert Bridge to catch the 33 bus back downtown. 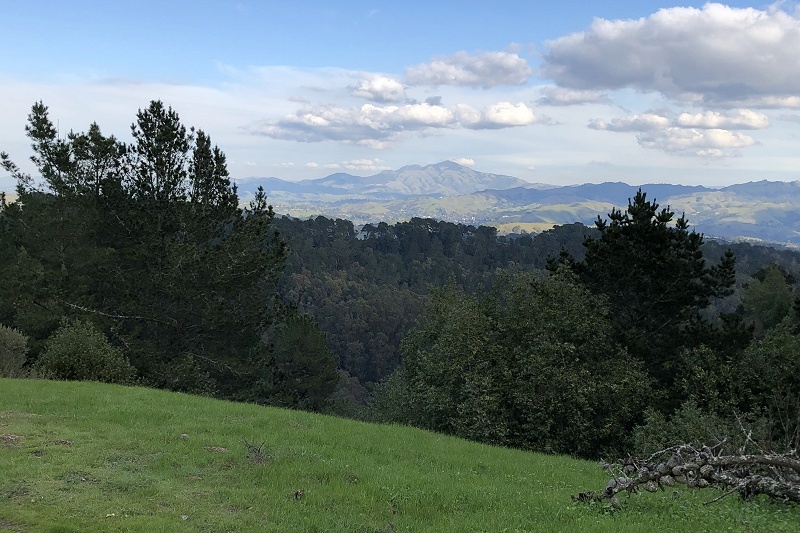 First, go behind the observatory buildings and find the fire road, which is part of the West Ridge Trail in Redwood Regional Park. 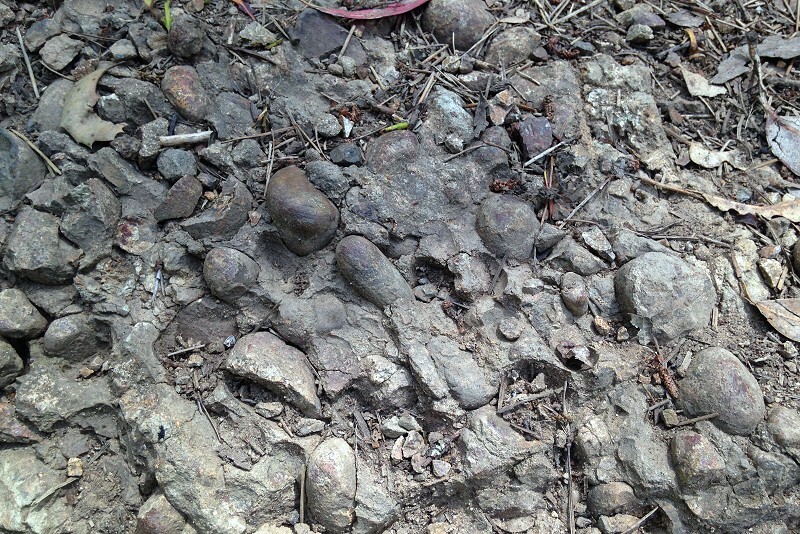 The trail exposes the conglomerate beautifully. The cobbles are exceptionally well rounded, a sign that they once tumbled a long way down a steep river into the sea. 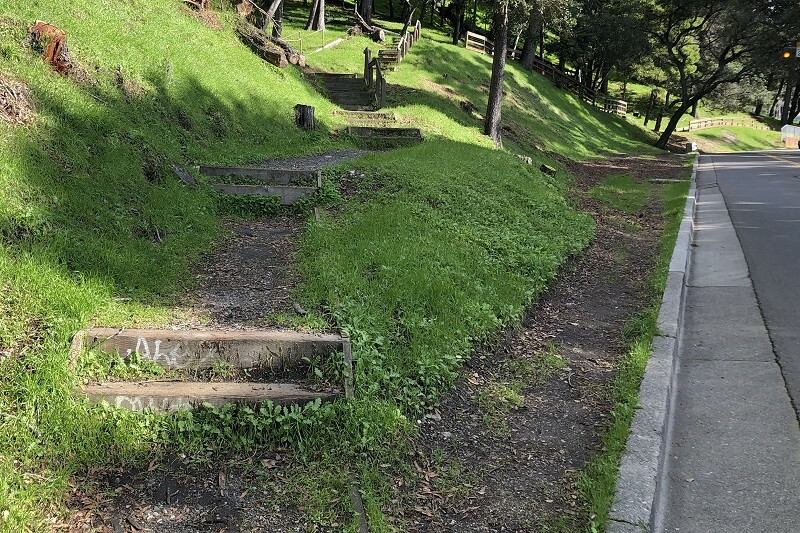 You could meander your way to Moon Gate, on Skyline, where you’ll take the trail going left, or you could follow the steep and tempting path up to the water tank. 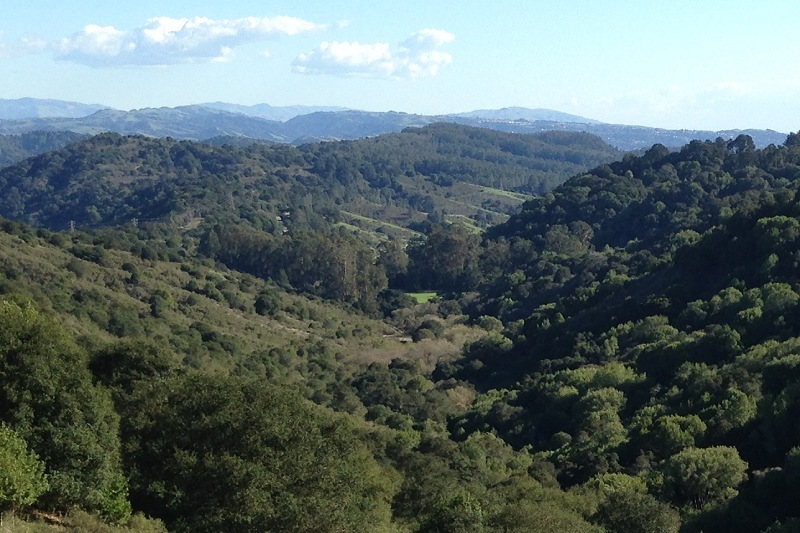 From there the views look north past a wooded hill, with Round Top peeking up behind it, to the Briones Hills . . .
or northwest toward Grizzly and Vollmer Peaks. A tiny trail on the other side will get you to some proper outcrops of massive sandstone, also part of the Oakland Conglomerate. Either way, you’ll then be on the Scout Trail heading south, then angling east down to Skyline. Along the way you’ll pass a young and vigorous redwood stand, planted in 1978 thanks to good old Jerry Brown. Cross Skyline and take the Castle Park Trail west. It’s a lot safer than walking on Skyline, and a nicer walk. 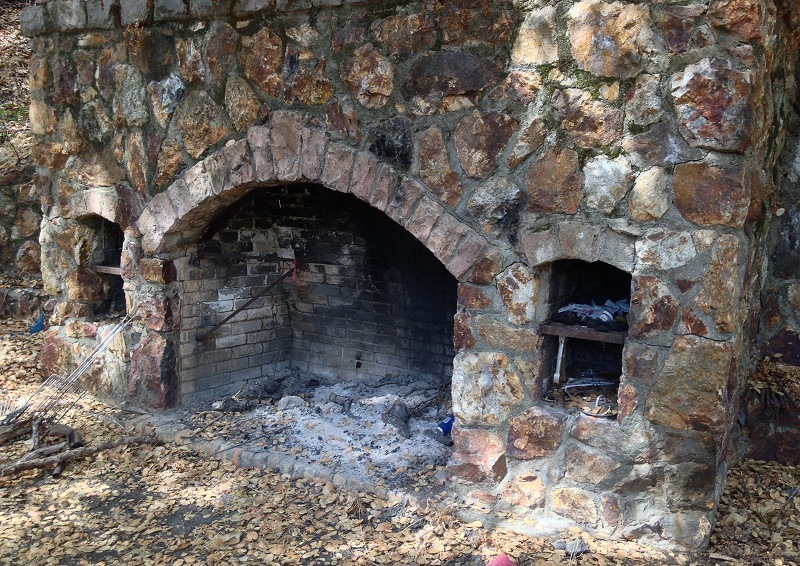 When you hit Castle Drive, take the pavement down to the secret fire road called the West Trail. 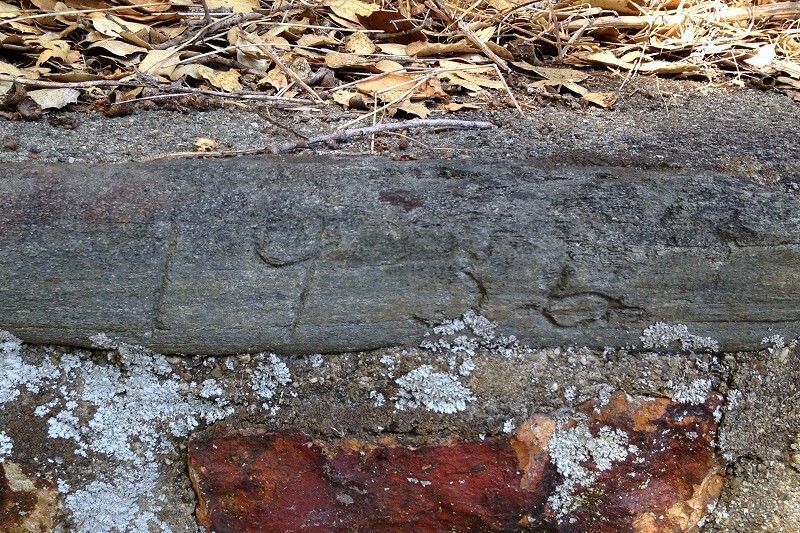 This is the original century-old road shown on Lawson’s map. Go on, you’ll thank me later. There’s a particular kind of peace to be found on abandoned roads. Once the trail ends, back at Castle Drive, you can pick your own best way down, an exercise left to the reader. 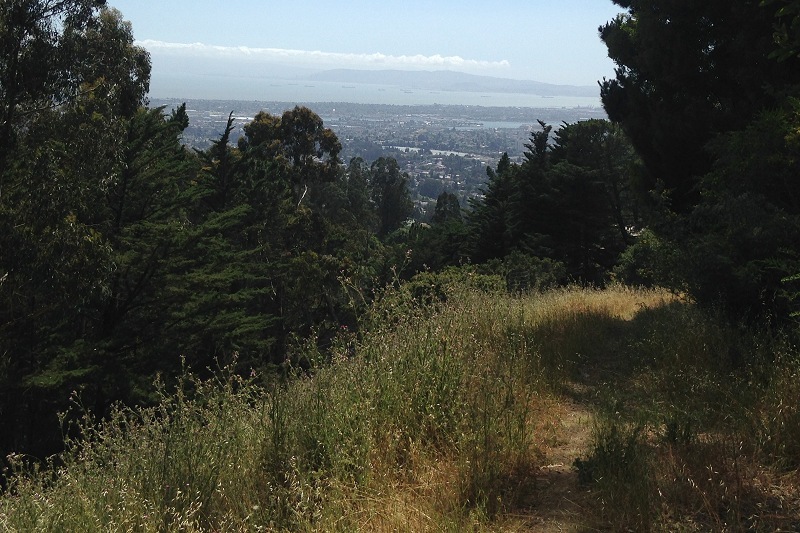 This was my way — 3.5 miles long, 1100 feet downhill. 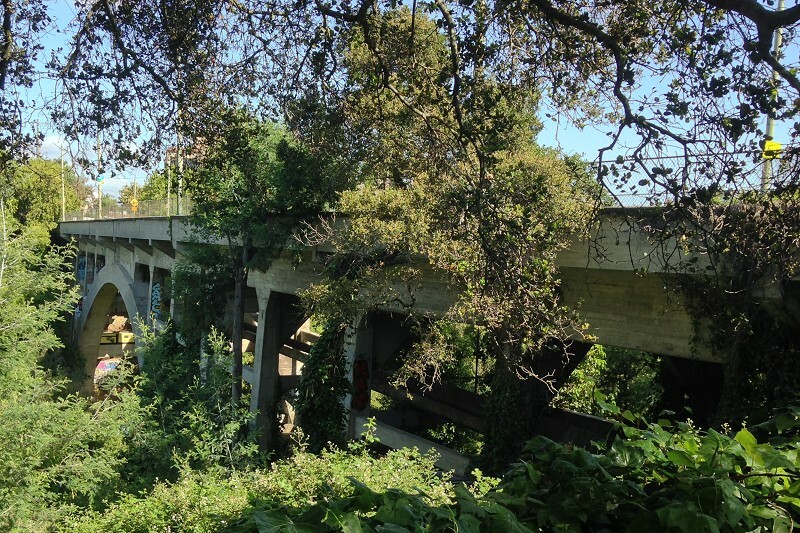 . .
through the redwoods and across Leimert Bridge. 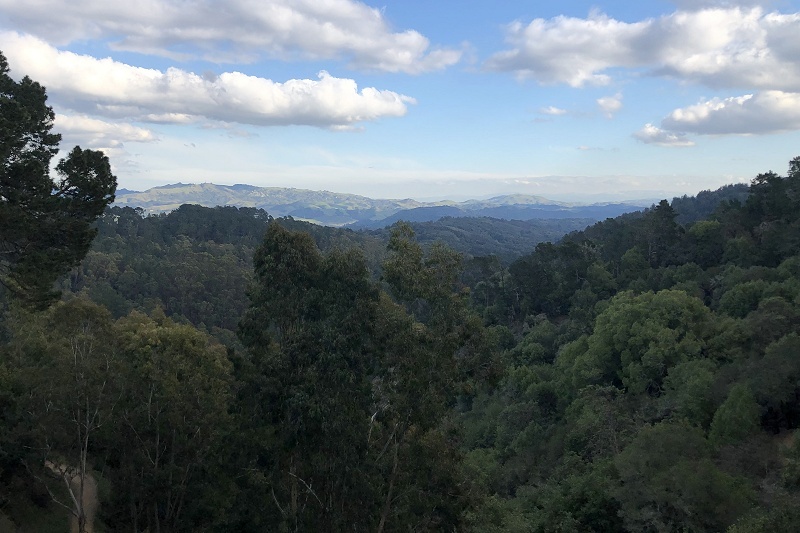 Over the last few weeks I’ve been exploring the remote land just east of Skyline Boulevard, over the city line in Anthony Chabot Regional Park. 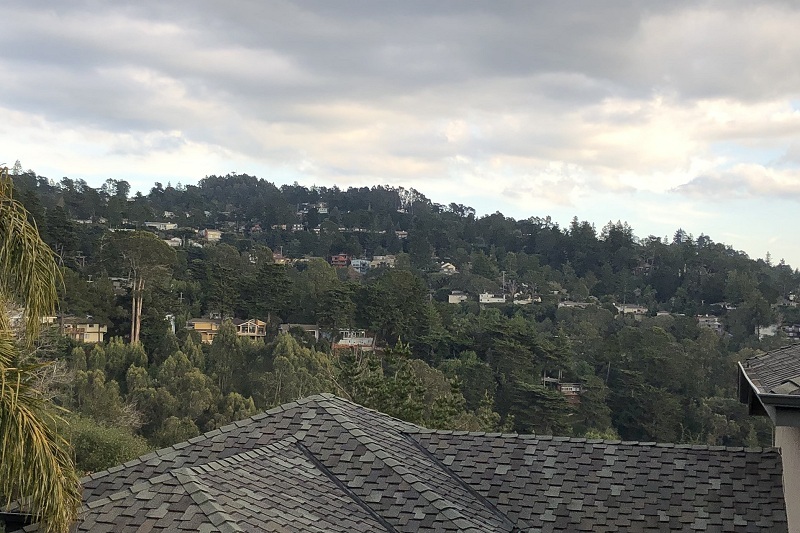 Time to show you some of the charming features of Grass Valley, seen here from Redwood Ridge near the Parkridge land bridge. In classic Geology Ramble style, this walk (a set of them actually) starts at one bus stop and ends at another. It starts at the top end of the 39 line and ends at the top of the 46L. The challenge is that you can only do this on weekdays because neither line runs on weekends; moreover both lines only run once an hour. Here are the two routes I’ve done so far, in the Google Maps terrain view just to give a feel for the territory (800 x 100 pixels). There are 12 photos in this post, locations given in a map at the end. 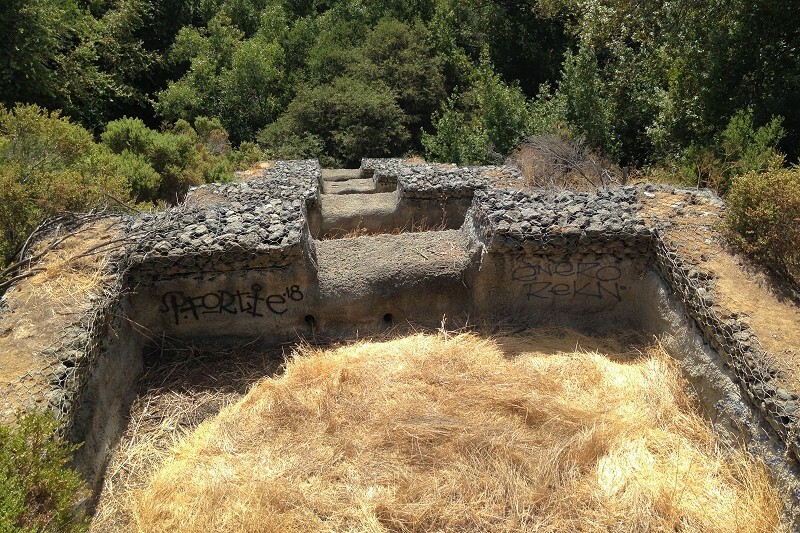 Amelia Sue Marshall, in her new book East Bay Hills, a Brief History, says that Grass Valley was never settled by whites or Ohlone because the stream was unreliable. Back in the day, redwood lumber was hauled through the valley to Castro Valley; only a few redwoods actually grew there. Later, cattle were driven through it between Oakland and Moraga. 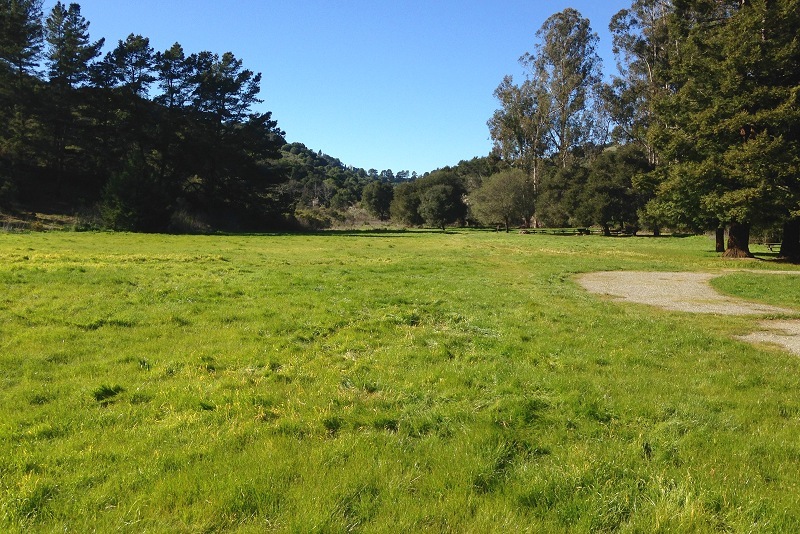 The Grass Valley Ranch raised cattle there for many years until the water companies moved in. 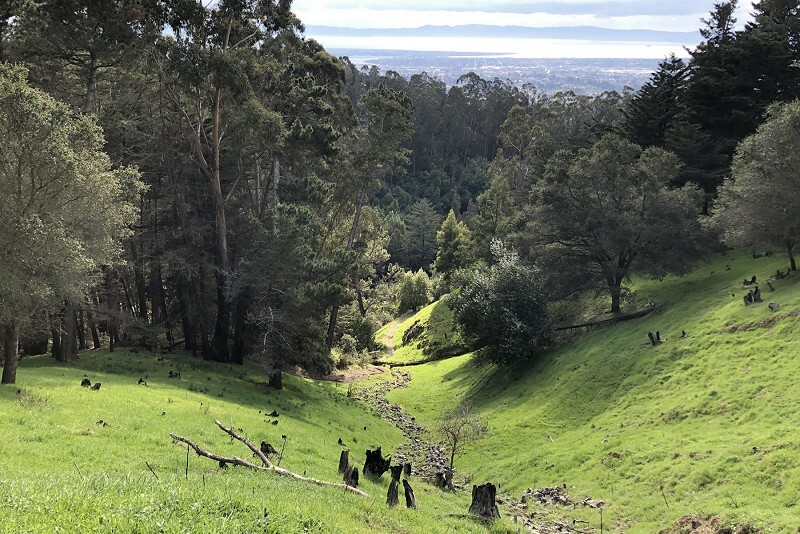 The East Bay Water Company and the Contra Costa Water Company both planted huge eucalyptus forests there, and finally East Bay MUD took them all over. 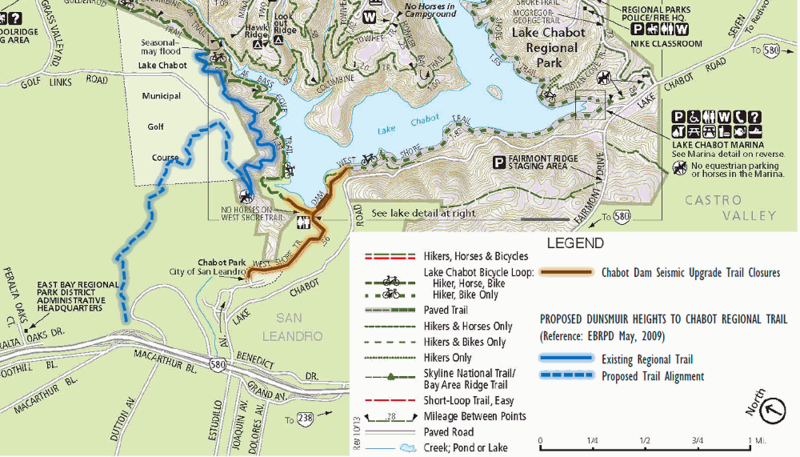 When they secured Sierra Nevada water, their East Bay land was transferred to the East Bay Regional Parks District, and that’s the story. The ramble starts at Skyline High School. 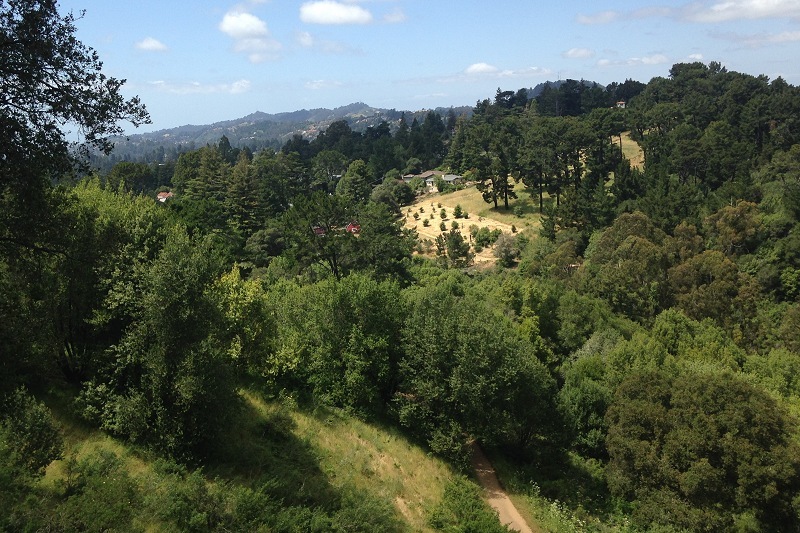 The scenic way is up the median path of Skyline Boulevard, charming in all seasons. It also exposes the Oakland Conglomerate, as I’ve posted previously. The road up to the city stables is marked by a sign. 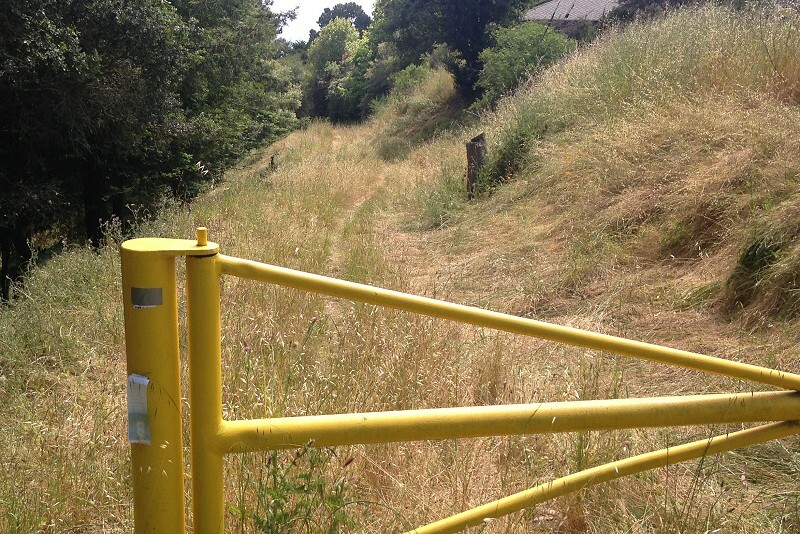 Go past the gate and enter the Goldenrod Trail, an old dirt road popular with horse riders. 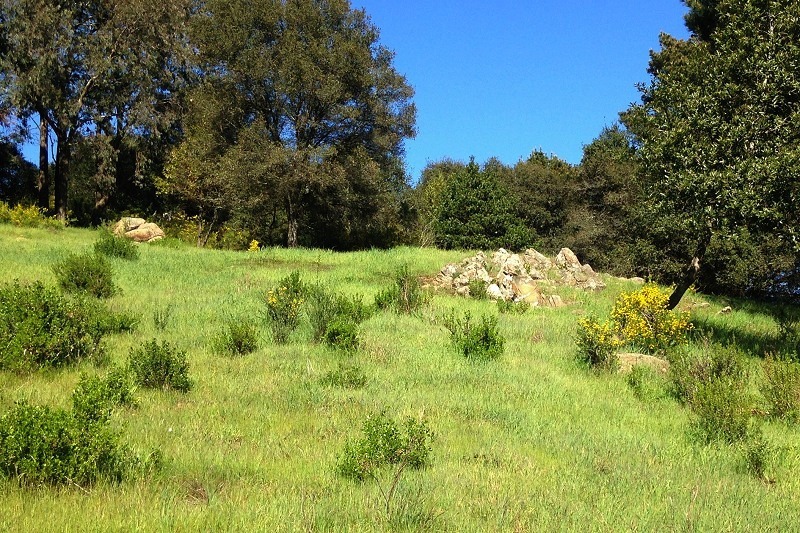 It’s pretty, and you’ll see outcrops of Oakland Conglomerate along the way. You knew I’d get to the rocks. 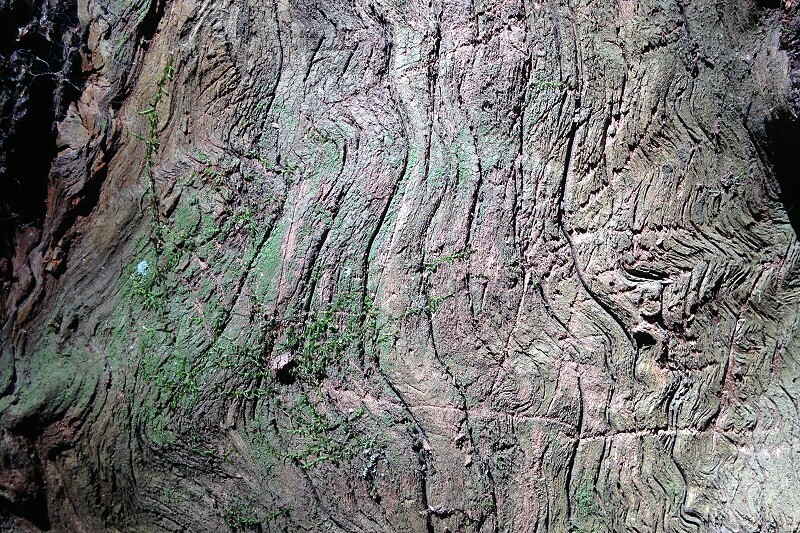 The gross terrain is shaped by the rocks beneath it, but not much rock is actually exposed. 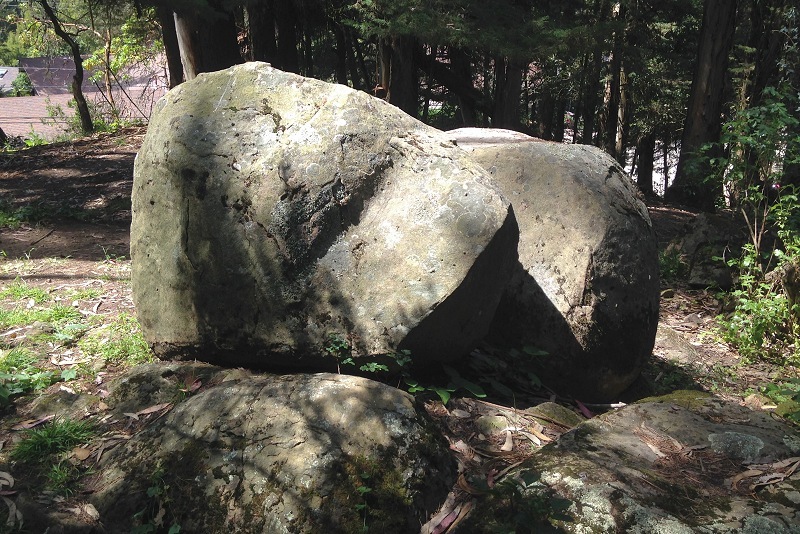 These rocks began as sediment, and to sediment they quietly return, mostly covering themselves in a forested blanket of soil. 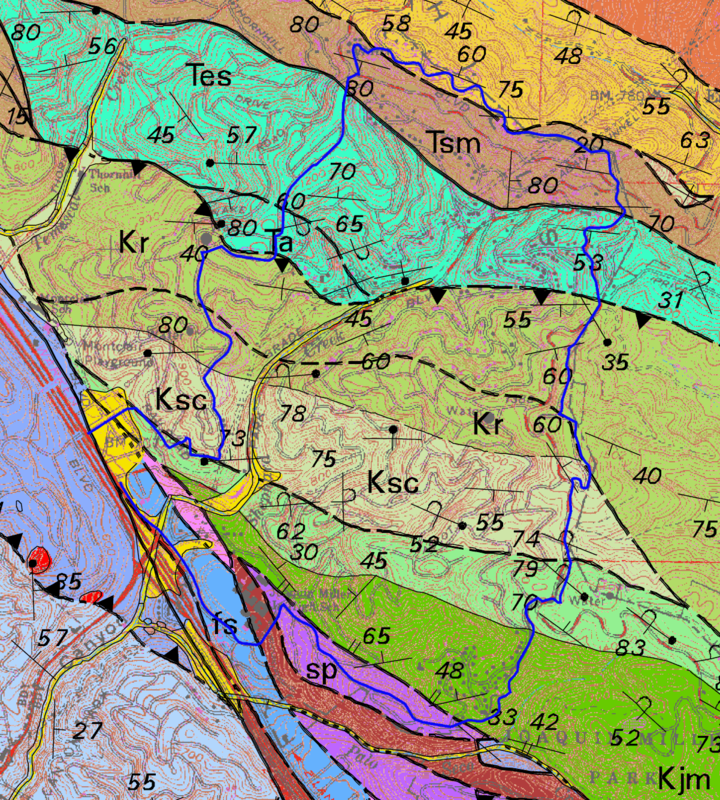 The important map units are Ko, Oakland Conglomerate; Ksc, Shephard Creek Formation (mostly shale); Kr, Redwood Canyon Formation (mostly sandstone). 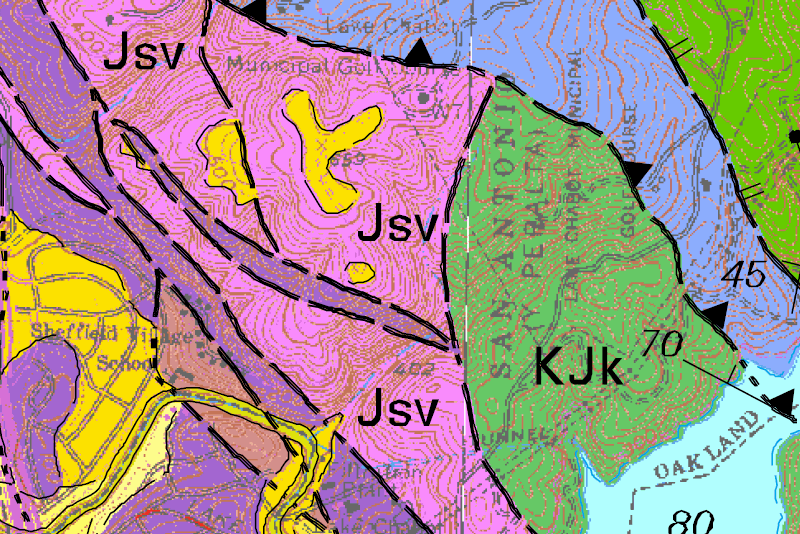 Grass Valley is strongly confined by the shale. 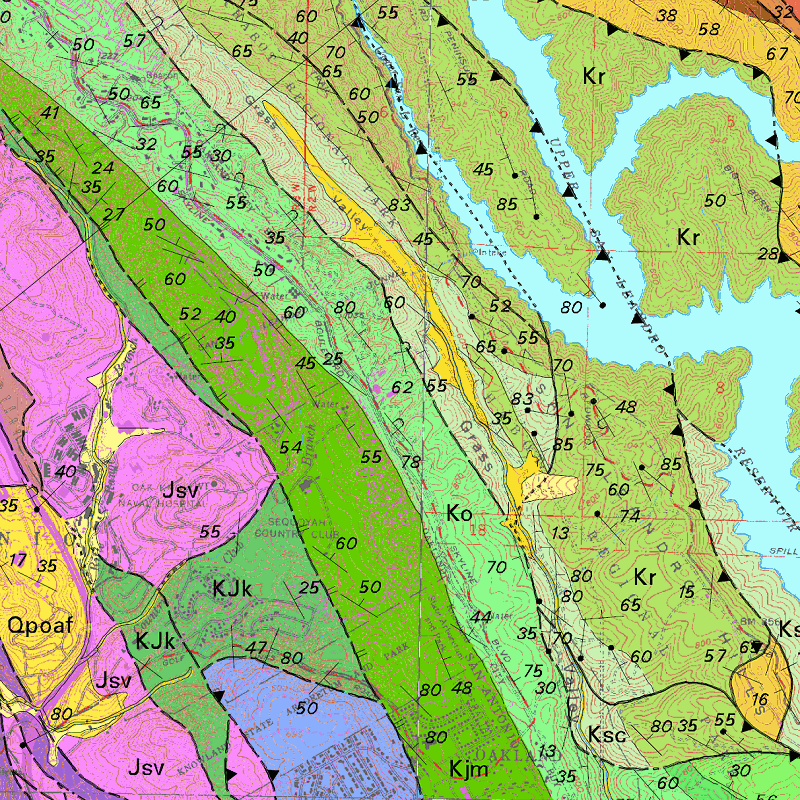 The upper slope, though, is conglomerate. 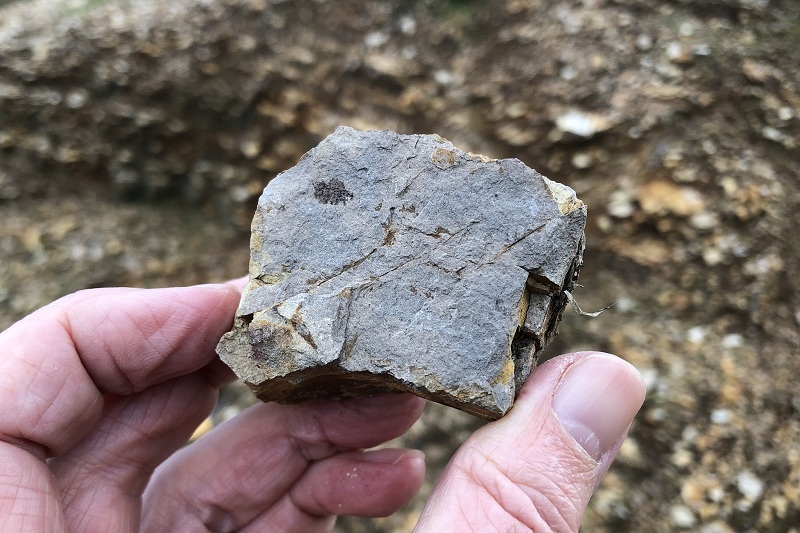 You can usually tell by the well-rounded stones embedded in it — samples of ancient mountain ranges. They get as big as this. And there’s more than rocks to shake a camera at. 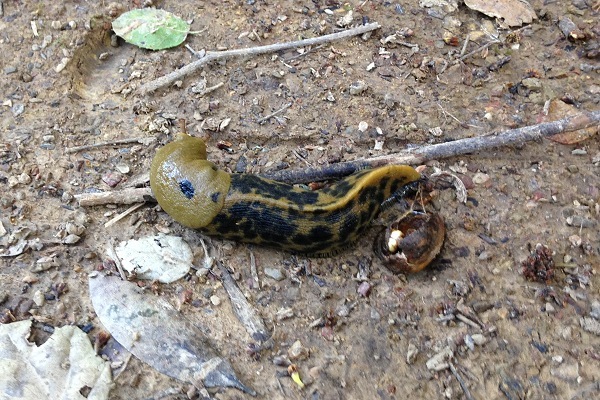 For instance, banana slugs. Take the Ranch Trail or the Buckeye Trail down into the valley. Near the bottom the woods open up nicely. After a while you reach Bort Meadow. A hundred years ago the water company called it the Big Trees area, but the park took down most of the eucalyptus and it’s much better now. 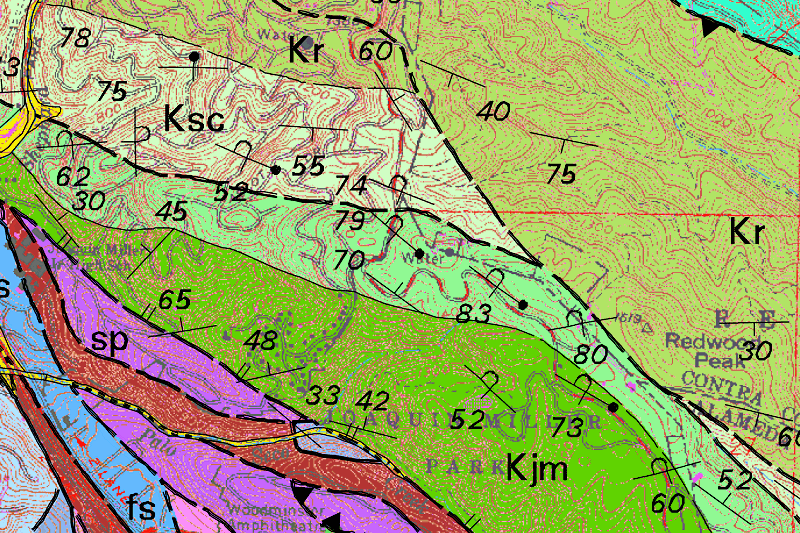 The stream gradient is very gentle; this area looks like it could have been a lake at various times in the recent geologic past, especially if landslides dammed it. 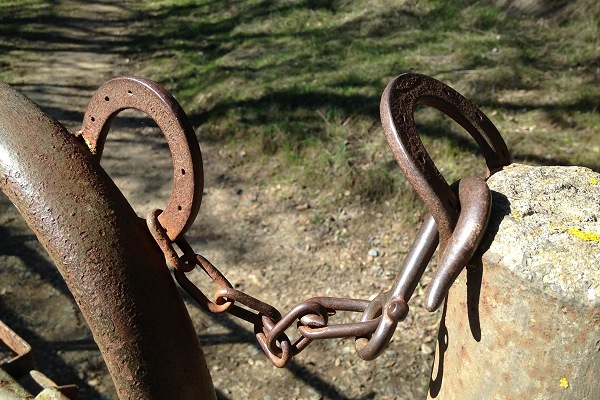 Grass Valley is still a ranchy, horsy, countrified place. Though it’s gone from drivin’ dogies to walkin’ doggies. The first time I came through the valley, unsure of my pace relative to the bus schedule, I was trotting. After that I knew I could amble instead. 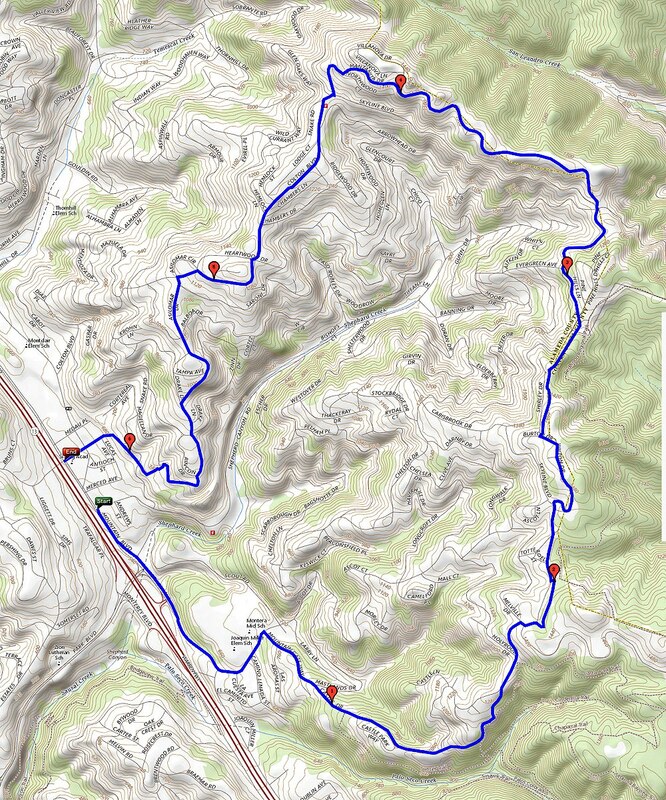 The whole hike is less than 6 miles, and the climbs aren’t that strenuous. Farther down the woods rise up and close in, first oak and then eucalyptus. By the time you reach the Stone Bridge the woods are thick. 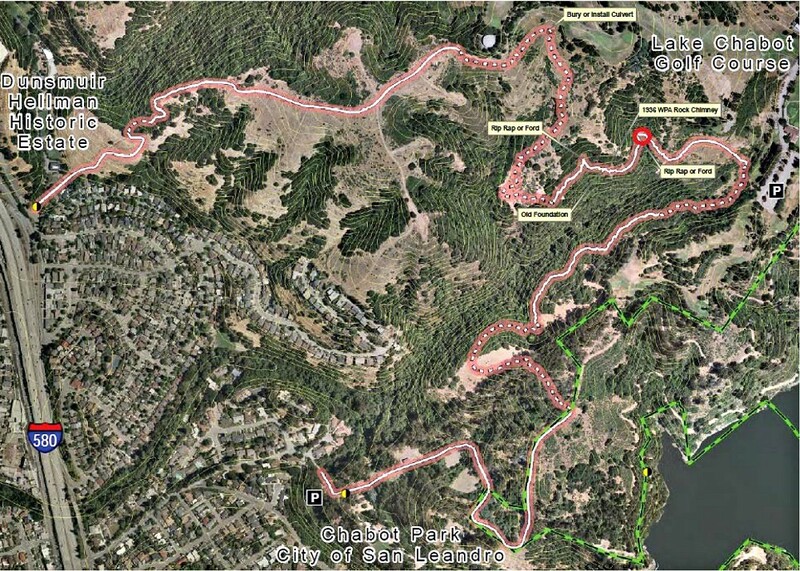 I haven’t yet gone farther toward Lake Chabot; the public transit logistics are pretty daunting. Take a minute to look at the streambed above the bridge; the Shephard Creek Formation is well exposed there, but look from afar because the creek bed is fenced off as sensitive habitat. 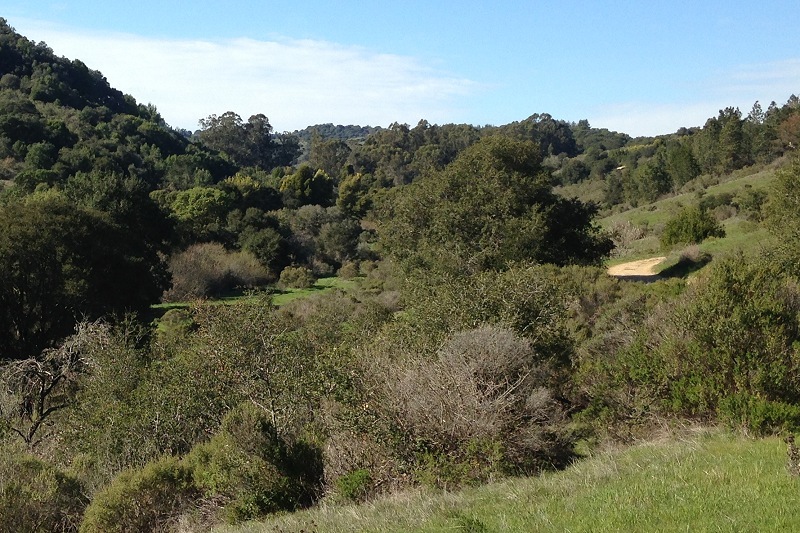 From the bridge turn up the Jackson Grade, where you’ll meet the bottom end of Skyline Boulevard. (There’s a water faucet at the top of the grade.) 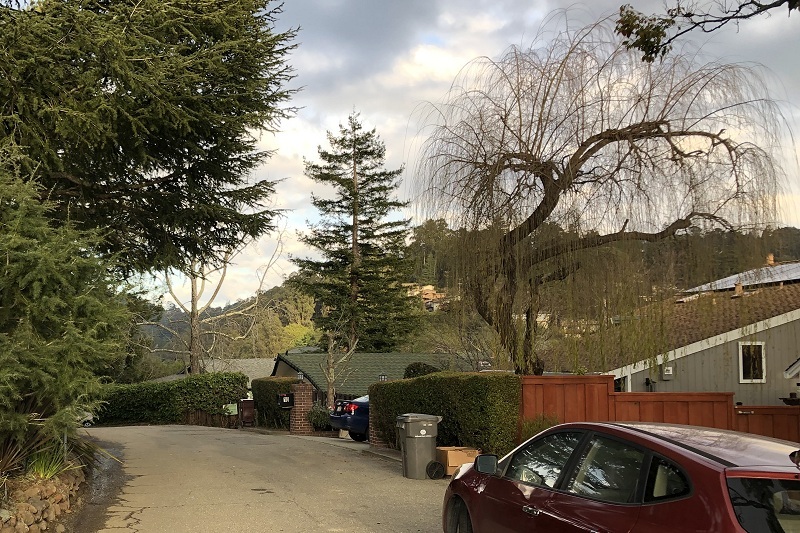 From there it’s a quick downhill into the Grass Valley neighborhood. 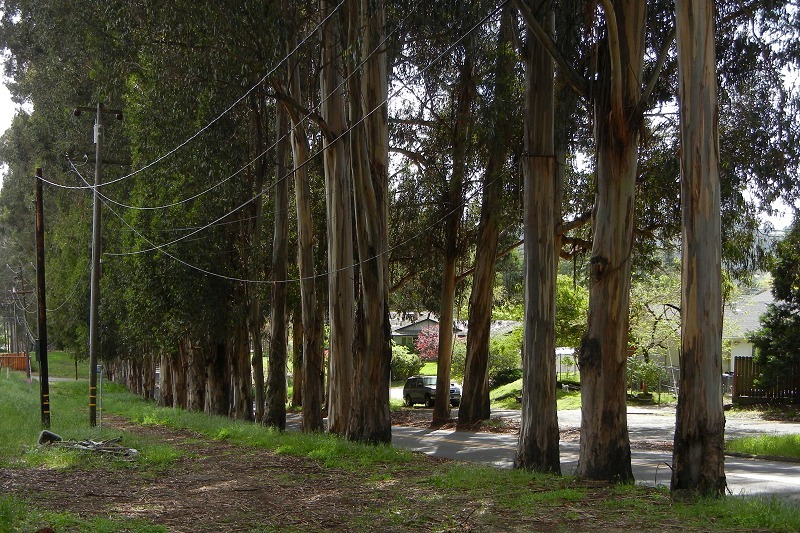 The eucalyptus allee on Grass Valley Road is pretty to look at, harrowing to drive and inadvisable to walk. Instead, cut over to Scotia and down Shetland and contemplate the classic postwar burbia around you as you head for the bus stop. As promised, here’s the photo key. You could take this route the other way, but it’s uphill, from about 500 to about 1100 feet.